In June of 1999, about a month before Colette turned 8, she was the "star" of dance show. I forget the exact story, but somehow she saved the children who had been captured by the evil witch and turned into birds. This photo op came after the show. Colette seemed to enjoy being the "star" and apparently didn't want her little sister Katrina in the picture. 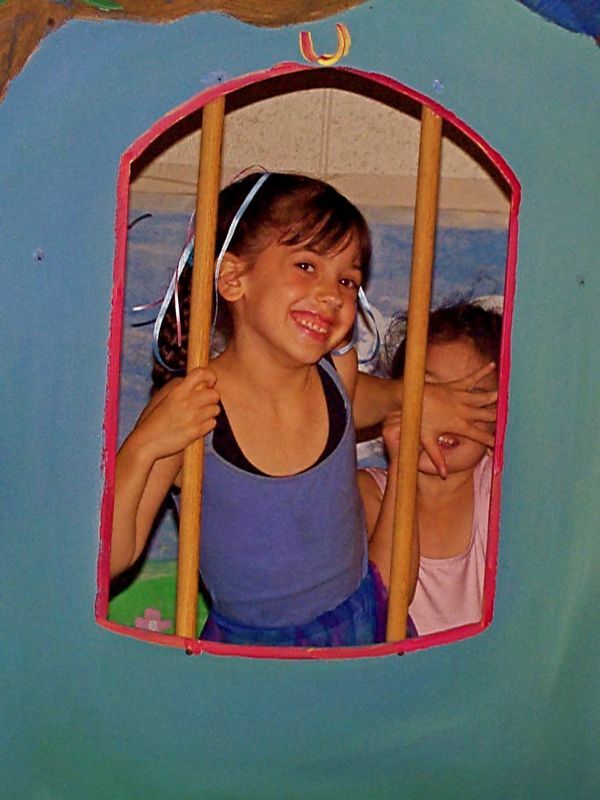 It was really all in fun, the next picture Colette was out of the "bird cage" and Katrina who was only 5 years old at the time was happily smiling from inside. We've always thought that Colette is and always has been the good natured, smiling, happy child. Perhaps she has us all fooled and this picture caught her duplicitous behavior. Anyway, this is one of Colette's favorite pictures and so it appears today, her 17th birthday (Colette and Katrina still torment each other with great sisterly love). How could she resist my adorable face?